The TNW Aero Survival Rifle, or ASR, is a lightweight, semi automatic, pistol caliber carbine. It is a takedown rifle, so you can pull the barrel off and store the whole kit in a backpack. The ASR comes in 9mm, .40 S&W, .45ACP, .357 Sig, and 10mm and you can even buy it in a multi-caliber package so that you can easily swap between different types of ammo. The ASR is newly available in 22LR and they’re working to make a version in 22 Mag and 17 HMR. Billed as a survival rifle for backpacking, flying and hunting, the TNW in 9mm offers a bit more pep than a takedown 22. Using a straight blowback mechanism with a heavy bolt means that the action is simple and easy to clean. The Aero Survival Rifle uses many familiar AR-15 parts, borrowing the extension tube, buttstock and grip. The straight line recoil layout also means that AR-height optics, from red dots to flip up sights and scopes will work great for the ASR as well. Given the cartridges used and limited ranges, a long battery life red dot with flip up iron sights would be a good match for the rifle. The ASR uses a simple cross bolt safety that works just fine. 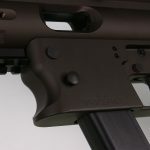 The magazine release is on the left hand side of the receiver and can be activated quickly with your thumb if you keep your left hand gripping the front of the receiver and magazine. There’s not much sense putting your left hand way out front because there’s nothing to grip other than the barrel and there’s not much weight out front either. Taking down the ASR for storage is a pretty straight forward affair. 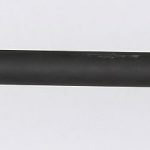 The captive barrel nut is loosened, the barrel comes off the front, collapse the buttstock, and pop it in your backpack. The barrel is timed by using a locating pin that engages with a recess in the barrel. Disassembling is pretty quick as well. 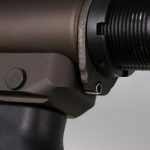 Remove the barrel as above, push the bolt back so that you can remove the charging handle, and the bolt pops right out. The recoil spring and mechanism stays back in the rifle unless you remove threaded pins from the top of the receiver. I found most of the cleaning had to be done on the barrel & feedramp, as well as the underside of the bolt itself, so it’s not super necessary to dig into the recoil guts of the rifle very often. As the rifle is optimized for robustness, simplicity, and takedown, something had to suffer. The ASR is a bit odd to shoot as it has a very heavy recoil spring necessary for 9mm blowback operation, weird ergonomics due to not really having a forend, and a very heavy, creepy trigger. Charging the rifle and locking the bolt to the rear using the recess can be a bit tricky. That all said, it was very easy to whack a 100 meter metal plate over and over again with this rifle. Like all pistol calibre carbines, it’s very tame to shoot and would be fun for even recoil sensitive people to fire. The bolt does not lock to the rear after the last shot, so the sound of a click means it’s time to reload. TNW offers a surprising amount of aftermarket accessories ranging from threaded barrels for suppressors to extended forends, pistol-style ASR’s, 80% kits that you can complete yourself, specially designed backpacks, and more. This particular 9mm ASR uses common Glock 17 style magazines, which is a great choice as there’s lots of those mags around and they’re inexpensive. 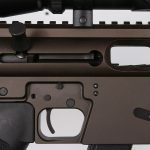 At 6 lbs, the Aero Survival Rifle is a lightweight pistol caliber carbine that’s perfect for backpacking around or storing for survival situations. The Glock magazines have enough capacity and quite a bit more oomph than a 22. 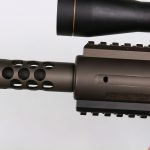 So if you’re looking for a PCC survival rifle, check out the TNW ASR.